Originally posted: October 25, 2017 . Last modified: April 13, 2019 . 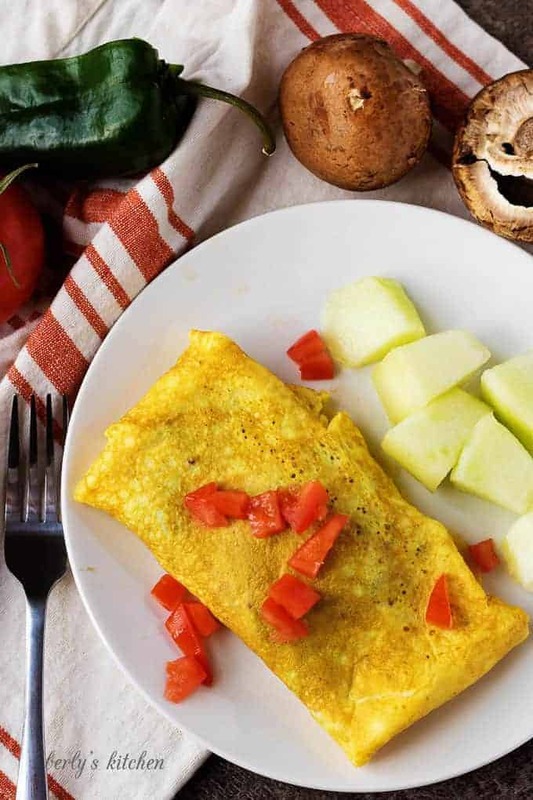 A simple veggie lover’s mushroom omelet made with eggs, mushrooms, onions, peppers, swiss, and tomatoes. It’s a great option when you’re out of bacon. I’ve always been a huge fan of omelets. Kim, not so much, until got married. However, over time, they’ve grown on her. She usually enjoys an omelet with Hatch green chiles and cheddar cheese. When it comes to loaded versions of the dish, I am your man. Especially, a well-made mushroom omelet. Keeping that in mind, I couldn’t wait to share this recipe with everyone. Unlike our breakfast burritos, it’s not filled to the brim with meat and cheese; but it still manages to be very satisfying. Honestly, I think it’s because of the mushrooms. Since we aren’t fans of soft foods, the vegetables are only lightly sauteed. In fact, we don’t cook the tomatoes at all. 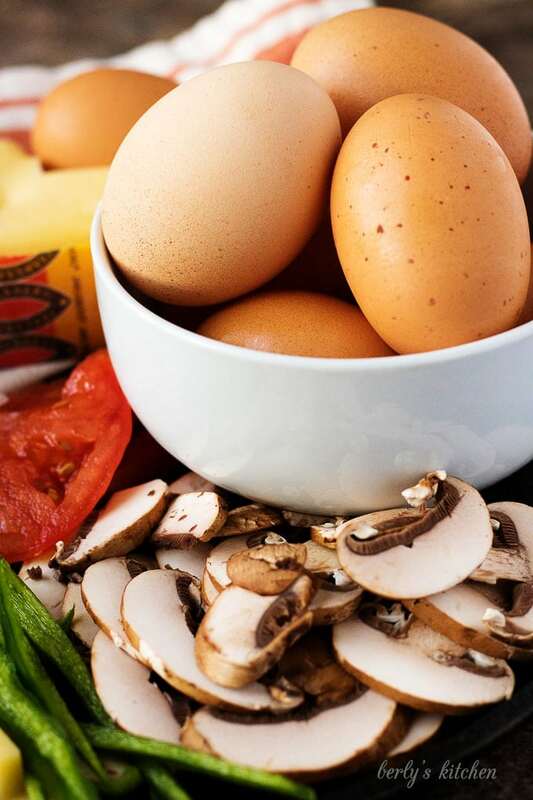 They are used as a fresh, tasty garnish to contrast the yellow color of the mushroom omelet. 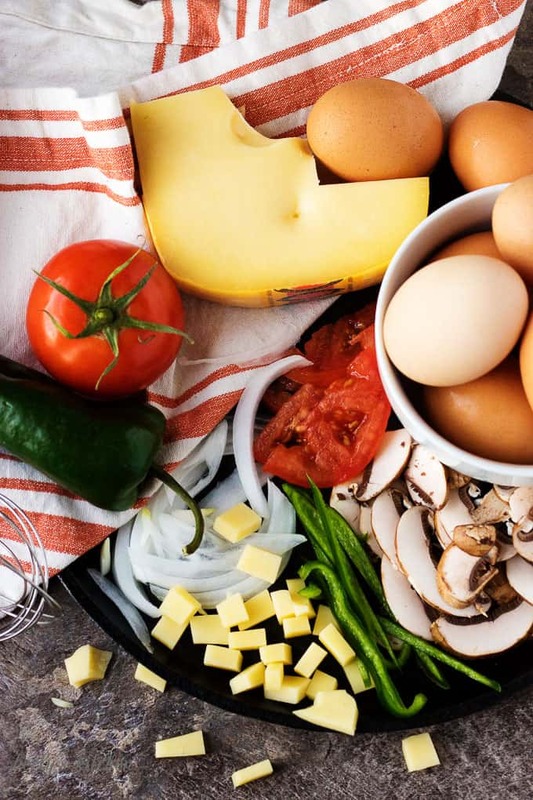 As you will see in the pictures, we chose organic eggs, poblano peppers, portabello mushrooms, vine-ripened tomatoes, and swiss cheese. Also, please note this recipe is for one omelet. You may also notice this mushroom omelet isn’t the “fold-over,” variety. Kim and I found it’s much easier to fold the eggs into a burrito. It’s less likely to break and fall apart. One other tip, please don’t try to flip the eggs. They will cook all the way through if you leave them alone. If you want, poke a few small holes in the eggs where they’re raw. The heat will pass through and should help speed things up a bit. On the other hand, if you feel gutsy, take a spatula and slowly drag the cooked eggs towards the center of the pan. This action will allow the raw eggs to come into contact with the hot pan. Doing so takes a delicate touch and is not recommended if you’re a novice. First, in a small saute pan, cook the mushrooms, peppers, and white onions over medium heat for four to five minutes. The vegetables should be fork tender. Next, in a small bowl, whisk the eggs, similar to making scrambled eggs. After that, spray a large saute pan with non-stick cooking spray and pour the eggs into the pan. Let them cook over medium-low heat and do not mess with them. After a few minutes, the eggs will cook all the way through. 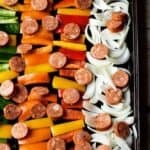 See my tips from above on this part of the recipe. Last, add the sauteed veggies and cheese to the omelet. Place them in the center of the dish, like you are making a burrito. Remove the pan from the heat. Use a spatula, and gently lift the edges of the mushroom omelet. Now, fold the eggs inward on all four sides of the veggies. You should have a cute egg burrito. Garnish it with the tomatoes and serve hot. That’s it for this recipe. I invite you to try our mushroom omelet. If you’re looking for a side dish, then consider hash browns. In closing, I wish you a long life, everlasting love, a belly full of tasty eggs. 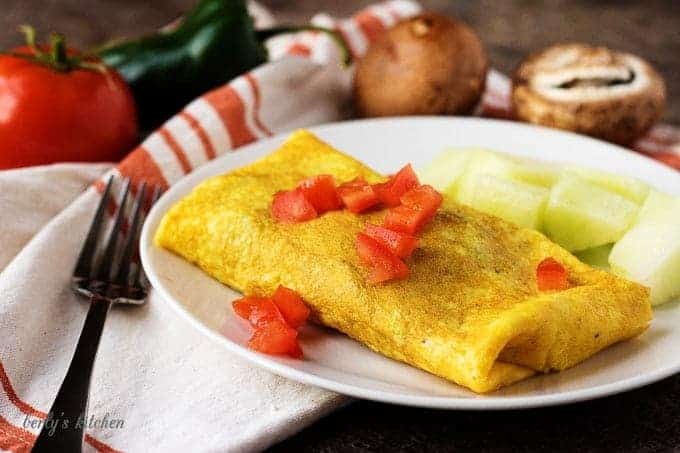 A simple veggie lover's mushroom omelet made with eggs, mushrooms, onions, peppers, swiss, and tomatoes. It's a great option when you're out of bacon. First, in a small saute pan, saute the mushrooms, peppers, and white onions over medium heat for four to five minutes. The vegetables should be fork tender. Next, in a small bowl, whisk the eggs, similar to making scrambled eggs. After that, spray a large saute pan with non-stick cooking spray and pour the eggs into the pan. Let them cook over medium-low heat and do not mess with them. After a few minutes, the eggs will cook all the way through. Don't worry about flipping them; they will cook thoroughly. 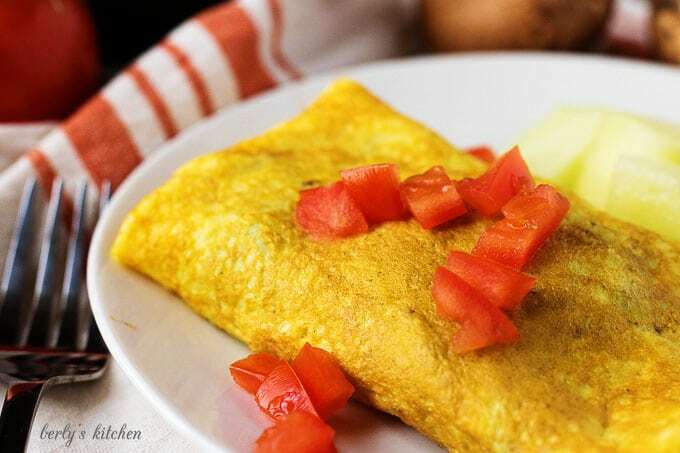 If needed, poke a few small holes in the omelet where the eggs are still raw. Last, add the sauteed veggies and cheese to the omelet. Place them in the center of the dish, like you are making a burrito. Remove the pan from the heat. Use a spatula, and gently lift the edges of the mushroom omelet. Now, fold the eggs inward on all four sides of the veggies. You should have a cute egg burrito. Garnish it with the tomatoes and serve hot. 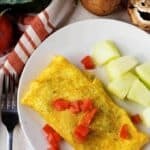 The calories listed are based on the ingredients and represent one whole omelet as a serving. Actual calories may vary. The dish is best served hot and storage is not recommended. 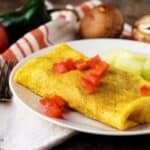 I love mushrooms, so i know i would really love this omelet!